In our latest episode, Angela McClure announces the revival of a soybean yield contest in Tennessee. Listen to the podcast, and be watching the blog next week for more information from Angela on rules and registration forms. Wet conditions due to recent rains kept most farmers from their fields. Some corn was planted, but most row crop farmers were limited to preparation work. Wheat development was aided by above normal temperatures. Pasture and forage condition also benefitted from the higher temperatures. There were 3.6 days suitable for fieldwork last week. Topsoil moisture rated 1 percent short, 59 percent adequate, and 40 percent surplus. Subsoil moisture rated 1 percent short, 62 percent adequate, and 37 percent surplus. All Crops Flood Damage rated 3 percent severe, 16 percent moderate, 25 percent light, and 56 percent none. All Crops Rain Damage rated 3 percent severe, 18 percent moderate, 27 percent light, and 52 percent none. Continue reading at TN Crop Weather 04_15_19. The U.S. Crop Progress report can be read at US Crop Progress 04_15_2019. Dr. Joanne Logan is a research professor with a focus in applied climatology. In this episode, she discusses her research along with an outlook of 2019 weather patterns. Listen. Corn, cotton, soybeans, and wheat were up for the week. Continue reading at Tennessee Market Highlights 4_5_2019. While I have not heard of any reports of diseases in wheat in Tennessee, as we get closer to flag leaf it will be important to be scouting for diseases. To better guide fungicide decisions, one first needs to correctly identify what disease they are trying to manage. Resources on both disease identification and fungicide selection can be found on the new, mobile-friendly field guide at guide.utcrop.com. 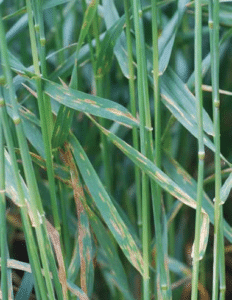 Major diseases of concern include stripe rust and leaf rust of wheat. There have been reports of rust to the south, there’s still not any near Tennessee or its borders. Rust spores usually cannot survive northern winters and have to be blown in from the south each year, (see Figure 1 – wheat rust pathways from http://www.ars.usda.gov/Main/docs.htm?docid=9757 which also contains specific reports on rust in wheat). Figure 1. 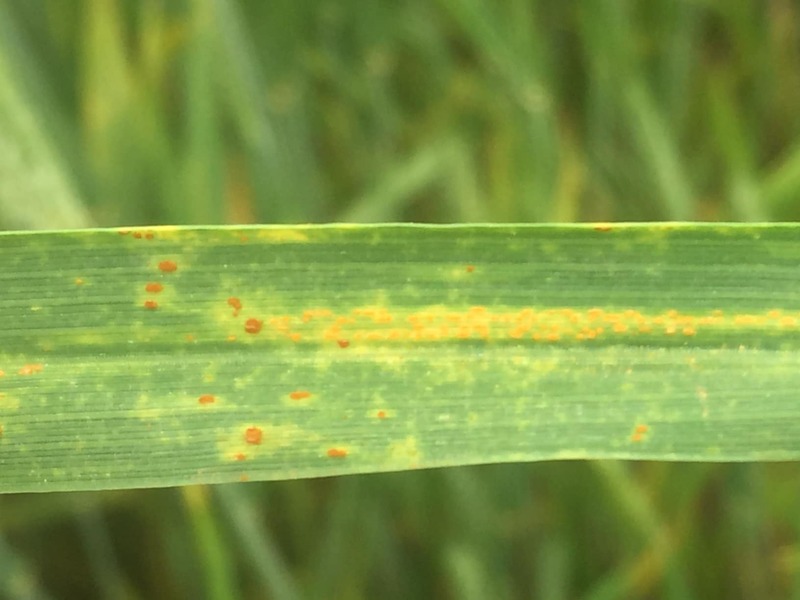 Wheat rust pathways in the U.S.
Stripe rust (caused by the fungus Puccinia striiformis) has a cooler, optimal temperature range (50 to 64 °F) and intermittent rain or dew promotes infection and disease development. 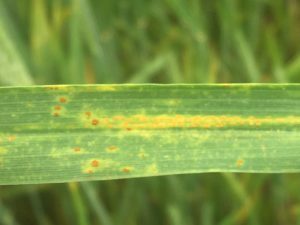 Stripe rust is best identified by tiny, yellow to bright orange pustules that form distinct stripes on the leaves (Image 1 and 3). 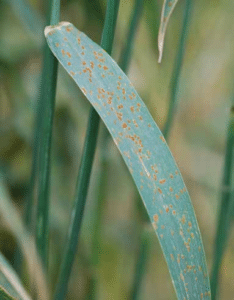 Leaf rust (caused by the fungus Puccinia triticina) has a warmer, optimal temperature range (64 to 77 °F) along with high humidity or moisture to promote infection and disease development. Symptoms of leaf rust include small round or oblong raised pustules that are orange red in color. Leaf rust pustules are more scattered and larger in size compared to stripe rust (Image 2 and 3). Image 3. Leaf rust pustules on left are darker orange and larger than the stripe rust pustules which are arranged in a line on right side of leaf. Two other common diseases observed in Tennessee include septoria leaf blotch (Septoria tritici) and stagonospora leaf/glume blotch (Stagonospora nodorum). The leaf lesions look very similar and usually begin in the lower canopy and progress upward, with the latter disease also causing discoloration on the glumes (Image 4 and 5). Some injury, such as fertilizer burn or freeze damage on the leaves, can look very similar to these diseases. Noticing where in the canopy the symptoms are seen and if they are progressing will help distinguish injury from disease. More information on these diseases and others can be found at guide.utcrop.com as well as at UTcrops.com. 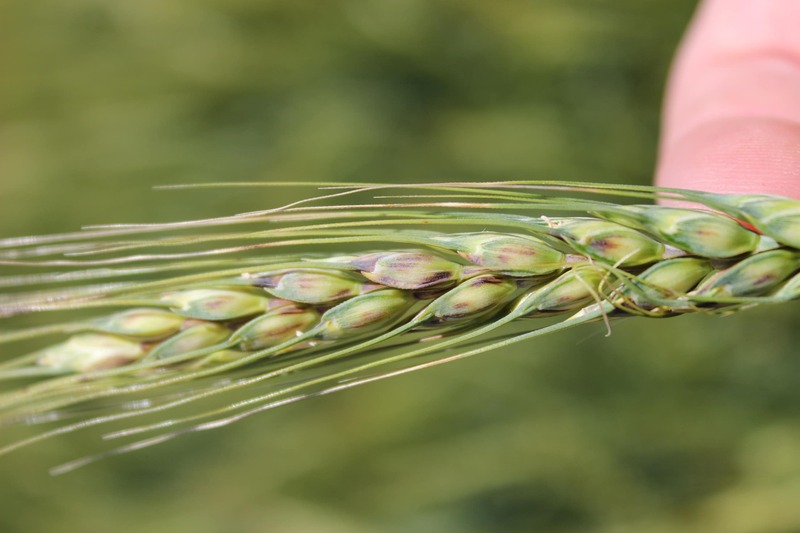 The decision to apply a fungicide to wheat should be based upon multiple factors including: 1) disease presence, 2) fertility and yield potential, 3) weather conditions and 4) cropping history. A detailed foliar fungicide point system can be found at UTcrops.com (Wheat Foliar Fungicide Point System) that can be used as a guide to determine the need for a fungicide application. Fungicide applications in wheat are most beneficial after the flag leaf has emerged (Feekes 9 or later growth stage), since the flag leaf can make up approximately 75% of the leaf area that contributes to grain fill. Fungicide application can be delayed further if no disease is present and/or there is low disease risk.